"Our prayers are answered not when we are given what we ask - but when we are challenged to be what we can be." Psalms 66:20 states: "Blessed be God, Who has not turned away my prayer, nor His mercy from me!" Starting today, you can declare just like king David did, when he'd said: "Blessed be God, Who has not turned away my prayer, nor His mercy from me!" What a profound and powerful statement David had made. 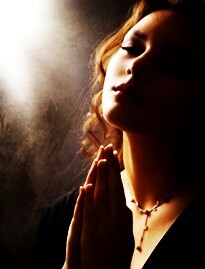 Many times in our lives, we find ourselves coming before God in prayer. Always in a hurry, stressed, wanting the Lord to do something at that very moment. And when we can't see immediate changes, then we make the mistake of thinking that God didn't hear us, for if He did, then why are things taking so long to change for the better. Maybe for a long time you have been praying for certain things to happen in your life, and now it seems that God is not coming through for you. Now you're beginning to lose hope and because of this, you're becoming despondent and desperate. And to make things worse, satan sees this, now he's smiling, because he now know, you're close to giving up. Now dearly beloved, now is the time, to start blessing the Lord with your faith. Simply start with thanking Him through prayer, no matter what you may find yourself going through. Know that God will never let you down. Know that your breakthrough is a lot closer than you may be thinking. I declare, right now in the name of Jesus, your blessing is close. Now it doesn't matter, if you've been waiting ten years for something to happen, know that your time is close at hand. I'll tell you this, God's favor is upon you! So go ahead, and give Him the praise, glorify his Holy Name. I'm hoping that you're able to see, that by drawing near to the Lord, how much easier it is, for your life to shine. O, how God is faithful! Don't ever give up, now or in the future. Know that the Lord hasn't given up on you. For He cares too much for you, to give up on you. I know that you'd endured, while you've been waiting for His mercy and favor to come through for you. However, in spite of this, develop the type of faith that will compel you to rejoice in His presence, no matter what. I'm hoping that one day, you'll be able to have the type of faith, that will allow you to go before God, knowing that the Lord will hear you; knowing that your prayers, in due time, will be answered. I'm trusting God, your spirits were revived and lifted up by this Bible devotion. Brothers and sisters, forever stay in God's hope, and never forget, that regardless of what's going on around you, that you are abundantly blessed.